By Greg BurgasCape Horn, like so much of fiction, is about power. When you introduce a colonial element to it, it becomes more about cultural power, as the frontier of Tierra del Fuego, like the frontier of the West in the United States and Canada or any frontier, really, is about the clash between “civilization” and “barbarism.” Just because Perrissin sets this in a place unfamiliar to most people doesn’t change the paradigm too much. The natives in the area, mainly the Yamana, have a choice to make–accommodate the Europeans and try to learn their ways, or resist as fiercely as possible and get killed or die out.And:Ultimately, Perrissin comes down on the same side as most liberal writers–that the natives would have been better off without the “benefits” of “civilization”–but that doesn’t mean he doesn’t try to show the kindness of people like Bridges, who really do believe they’re working to make the natives’ lives better. It's surprising to learn that a "first contact" situation with Indians happened in the late 1800s. I'm used to first contacts happening in the 1600s and 1700s, with tribal independence eliminated by the late 1800s. But here we have a sad drama unfolding a couple of centuries after it unfolded elsewhere. I guess that's how long it took to settle Tierra del Fuego. Anyway, Cape Horn followed too many characters to be an unqualified success. Other than that, I agree with the above reviews. It's well worth checking out. Hollywood's practice of whitewashing characters is in the news again. This time, several major Asian characters have been turned white. For more on the subject, see Diversity Lacking at 2016 Oscars and Asian Jokes at 2016 Oscars. For more on the Washington Redskins, see Initial Reactions to Redskins Poll and Washington Post Defends Redskins Poll. By Eric RitskesIn sum: we have a savage Indian warrior and a (dead) Indian princess, the only two Indigenous characters (one dead)--in a film supposedly telling ‘forgotten’ Indigenous history--battling the one bad racist. I won’t spoil the end, in case you enjoy watching White settler colonial dramas masquerading as politically conscious movies, but The Activist is not a movie about Indigenous struggle; rather, it is one that uses the backdrop (and it really is little more than news reports in the background) of the Indigenous struggle at Wounded Knee to mask tired colonial narratives of disappearing Indians and settler replacement through White heroes who are down with the struggle as long as they get to become Indian.A video showing Tonantzin Carmelo as Sacheen Littlefeather. The good cop and bad cop may have been clichés, but I thought they were the most interesting characters. Certainly more interesting than Marvin, the non-Native activist, and Bud, his Native bud. As someone who's trying to make my own independent films, I can appreciate a movie set almost entirely in two rooms. But I don't think it succeeds. In The Activist, Sacheen Littlefeather becomes Anna, who is murdered like Anna Mae Aquash, during the Wounded Knee occupation or the equivalent. This has something to do with the uranium mining also featured in Thunderheart, so the evil Nixon administration wants to declare the rez a nuclear zone or something and take it over. The conspiracy plot is hard to follow, but the most annoying part is how the government lawyer wants to negotiate with the young white savior Marvin. Because Marvin knows Indians and is a bridge to them, or something. Moreover, Marvin enlists a pretty blonde lawyer to do his legwork while he's in jail. Because when you're in trouble with the government, a hot babe just out of law school is your best bet. Meanwhile, Bud (Michael Spears) can only fulminate in the next cell and get kicked around by the racist guard. Once again, Natives are supporting characters in their own story. The Activist is passable but nothing special. Rob's rating: 7.0 of 10. A century ago, U.S. policy aimed to sever the tribal allegiances of Native Americans, limit their ancient liberties, and coercively prepare them for citizenship. At the same time, millions of new immigrants sought their freedom by means of that same citizenship. Alan Trachtenberg argues that the two developments were, inevitably, juxtaposed: Indians and immigrants together preoccupied the public imagination, and together changed the idea of what it meant to be American. In Shades of Hiawatha, Trachtenberg eloquently suggests that we must re-create America's tribal creation story in new ways if we are to reaffirm its beckoning promise of universal liberty. The Shades of Hiawatha title is appropriate. 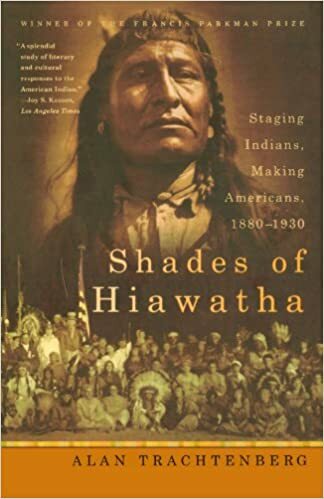 The book is kind of about how Song to Hiawatha filtered into the public consciousness and helped defined who and what was considered American. The six chapters are kind of disjointed, but Trachtenberg tries to link things back to the play and what it represents. I'm not sure he develops any deep or meaningful thesis--at least not one that I can summarize. But he explores some little-known areas of Native history, including the origins of Song of Hiawatha and the Wanamaker Expeditions. His writing is interesting enough that I give the book an 8.0 of 10, which is good for this kind of material. For more on the Washington Redskins, see Redskins in Unbreakable Kimmy Schmidt and Slants vs. Redskins. By Cassie WilliamsCornwallis was a British military officer who founded Halifax in 1749 while he was governor of Nova Scotia. He also issued the so-called scalping proclamation the same year, in which he offered a cash bounty to anyone who killed a Mi'kmaq person. Some have called for all commemorations of the man to be removed from the city. Others who oppose the move say that's akin to rewriting history.Comment: For more on Native-oriented monuments, see Artist Defends Scout Billboard and Quixotic Quest for The American. 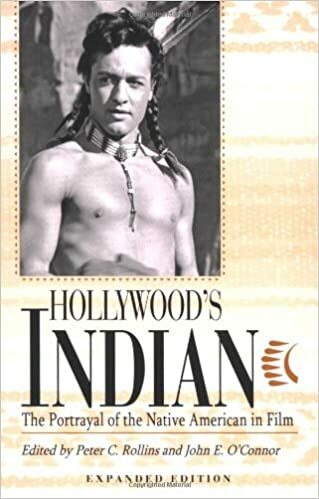 Hollywood's Indian: The Portrayal of the Native American in FilmOffering both in-depth analyses of specific films and overviews of the industry's output, Hollywood's Indian provides insightful characterizations of the depiction of the Native Americans in film. This updated edition includes a new chapter on Smoke Signals, the groundbreaking independent film written by Sherman Alexie and directed by Chris Eyre. Taken as a whole the essays explore the many ways in which these portrayals have made an impact on our collective cultural life. Comment: I read Hollywood's Indians and it's a solid academic-style book. Individual essays cover the usual milestones of 20th-century "Native" films: John Ford's movies, Broken Arrow, Tell Them Willie Boy Is Here, Little Big Man, Pow Wow Highway, Dances with Wolves, Last of the Mohicans, Pocahontas, Indian in the Cupboard, and Smoke Signals. As with most anthologies, some of its essays are more compelling than others. And of course it doesn't address the independent Native filmmaking that's flourished since its 1999 publication date. All in all, it's a useful but not essential book on Native-themed movies. Rob's rating: 7.0 of 10. 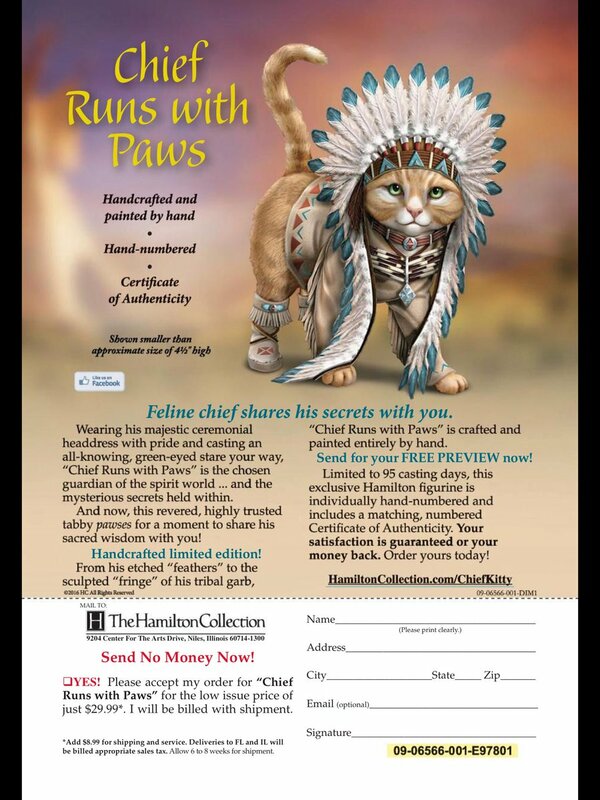 When "Chief Runs with Paws" is anything but cuteA description of the figurine on The Hamilton Collection's website reads: "Wearing his majestic ceremonial headdress with pride and casting an all-knowing, green-eyed stare your way, this adorable kitty is the chosen guardian of the spirt world." Paul says these are just a bunch of buzzwords. "They're using these words to make it sound magical and mystical and beautiful," she says. "They're buzzwords. They're sell-words to buy people into this idea of Native-ness—which is appropriation and not right." Because having a European or white heritage is better, I guess.